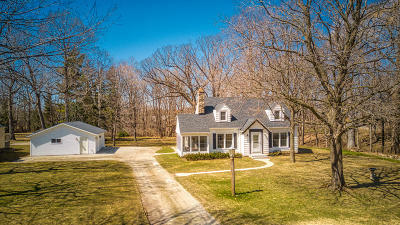 Hidden treasure in Whitnall school district on a near 1 acre wooded lot. You will be impressed at the impeccable condition of this home, it's charm, and features. Living room with crown molding and NFP is steps away from a sunlit cozy 3 season room. Bright kitchen has coved built in bench seating, pantry, glass tiled backsplash, and newer SS appliances. 2nd floor w/new 6 panel doors, carpet, new drywall, freshly painted walls & trim. Lots of storage! Don't pass this by if you are looking for more than 1 full bath. 5x10 room between upper bedrooms perfect for 2nd bath directly above main bath. Hard to come by 3 car garage built 2010, wonderful yard filled with birds, wildlife & a stone firepit/grill. Windows 2011, roof 2013, newer furnace/AC. Make this ''like NEW''home yours!